If you’re looking for inspiration to alter your teaching methods to match new standards and new times, this book is for you. 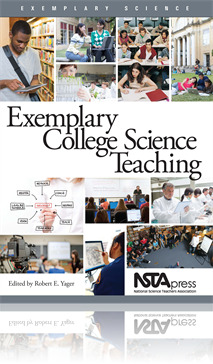 As the first in the Exemplary Science series to focus exclusively on college science teaching, this book offers 16 examples of college teaching that builds on what students learned in high school. Understanding that college does not exist in a vacuum, the chapter authors demonstrate how to adapt the methods and frameworks under which secondary students have been working and make them their own for the college classroom, adding new technologies when appropriate and letting the students take an active role in their learning. The clichéd image of the professor droning on before a packed lecture hall is a thing of the past. The essays in this book explain why—and offer the promise of a better future. Where college leadership demands change, this book could be a valuable resource for college instructors looking for ways and means of better meeting the needs of their students.The enthusiasm of the writers for the methods they are using is evident throughout the writing, and the data documenting their success is convincing.